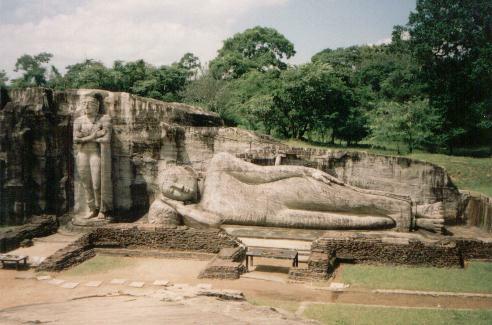 The 4 main statues in various poses at Pollonnaruwa are the most impressive sculptures and the imposing images of the Buddha located at the Gal Vihara. The first is of a seated Buddha in deep meditiation, seated on a throne decorated with lions and thunderbolts. The second is inside of a cave and records in detail Parakramabahu's initiatives to unite the Buddhist order. The next sculpture in the background stands 23ft (7m) high and expresses the serenity of the Buddha. The final and the largest statue is a reclining Buddha, which measures 46 feet (14m) in length. He is in the last moment of his life on earth, on the verge of entering nirvana. Cut from a single slab of granite, the statue date from the 12th Century A.D.